Thank you Kabam! 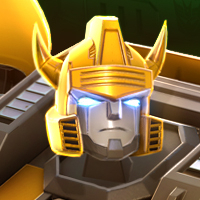 And can we get more of this during the Bumblebee Raid Event? Is it better to dupe or forge my 4* Megatronus? Something going on with Kabam servers? Wheeljack chips ending same time as Special Missions? Scout to Level up to Rank 3: ****Sideswipe (Ability Awaked) or ****Windblade (not Awakened)? 4-star Optimus Prime MV1 or 4-star Optimus Prime G1 to Rank 3? Can we get a warning pop-up box for Auto-Fight please? Different distance in Strong Attack? Are crystals and shard crystals "time stamped"? Invest in 3*** or 4**** bots? Bots stuck in Mission/Map mode?